Sturdiness and flexibility are fundamental virtues in the modern container transport sector. In particular, the ability to carry different container sizes with the same transport chassis has gained huge importance for transport specialists. Also, the process of selecting a different chassis to accommodate individual orders is time consuming. 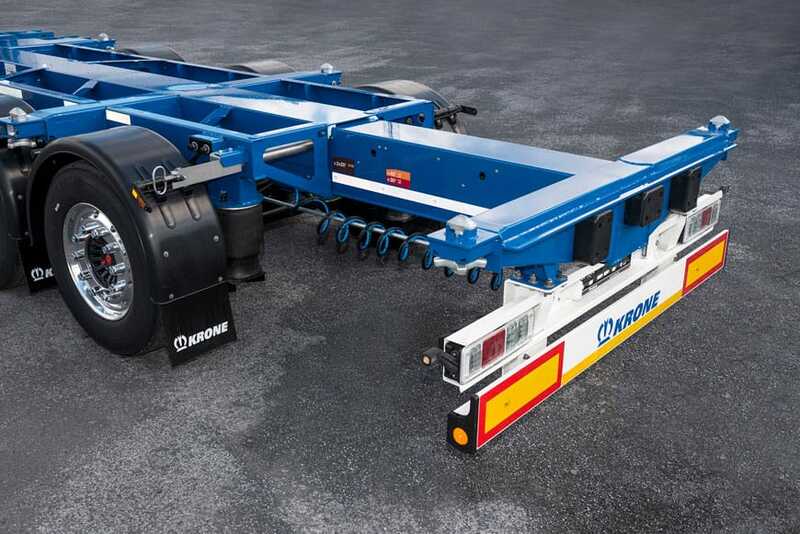 Krone however, has provided the solution with the Box Liner range. The latest model is the Box Liner SDC 27 eLTU70, which makes its début in Hanover. Features of the completely new design for the multi-functional chassis include its range of applications (20 to 45 feet), the modular superstructure, very easy handling, and last but not least, a low dead weight. Depending on the model and the use of high-strength steel (S700), for example, the payload advantage compared to the previous model is of 500 to 900 kilograms. The vehicle handling has been further improved, e.g. for the front extension, as well as for the operation of the front beam. The container locking system is easy to operate and ensures all box types are firmly secured to the chassis. The operating system for adjusting the chassis when changing between transporting containers flush with the rear, central positions, and long sizes has been further modified with simplicity in mind. For example, two 20-foot containers now ride on the same wheel base position as a 40-foot container on the short wheel base. At the same time, the load distribution is also improved for conventional use with two-axle semitrailers.